The videos are available on DVD. If you would like to request a copy be sent to you or your organization, please contact us via email at accessibility@metro.net , by telephone at 213-922-6919, or by mail at One Gateway Plaza, MS 99-21-5, Los Angeles, CA, 90012. Please make sure to provide your mailing address. 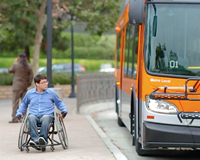 The Metro Customer Code of Conduct (English) (Spanish) provides that Metro may allow the reasonable modification of our policies to accommodate the special needs of persons with disabilities in order to allow them to fully utilize our services. Whenever possible a request for a reasonable modification or accommodation shall be filed in advance to the Manager of Accessibility and Paratransit by email at accessibility@metro.net , by telephone at 213-922-6919, or by mail at One Gateway Plaza, MS 99-21-5, Los Angeles, CA, 90012. Requests for reasonable modifications or accommodations will not be approved if the request would: fundamentally alter the nature of the service, program, or activity; create a direct threat to the health or safety of others; result in an undue financial and administrative burden; or the individual would still be able to fully use the services provided by Metro without the modification. 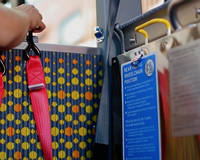 Individuals with disabilities may file complaints regarding reasonable modification or accommodation with Metro Customer Relations by telephone at 1.800.464.2111 or via email at customerrelations@metro.net . For questions on this policy, please see the Reasonable Modification Frequently Asked Questions . To make a request, please use the, Reasonable Accommodation Request form .